My first taste of goji berries came as a twenty-something foreign teacher in China. It was one of the delicious components of the famous “eight treasures” tea, and the berries were touted as being very nutritious. And indeed they are, with stratospheric levels of antioxidants plus a healthy dose of vitamin A. I’ve incorporated these delightful red berries in recipes before, first in spiced apple cider and more recently in a goji berry vinaigrette. Now it’s muffin time! If perchance you cannot obtain goji berries easily, dried cranberries will also work perfectly well. And they contain antioxidants too. Both berries blend nicely with the warm spices, beckoning you and your household into the kitchen as these muffins bake and are pulled out of the oven. We’re going to be baking and sharing muffins galore this month, and if you have not heard about Muffin Tin Month yet, I hope you will jump in and participate! I’d love to include your muffin recipe in the party! And you can take part in our baking challenge too! Find all the details in Wednesday’s post! In a separate bowl, blend together oil, sugar, honey, and eggs. Stir in applesauce. Combine wet and dry mixtures, stirring well. You can also use a mixer for this. Fold in dried berries. Pour batter into a greased muffin tin or tin with paper muffin liners. Sprinkle batter in each cup with oats and/or cinnamon sugar if desired. Bake for 15 to 18 minutes or until centers test done. Do not over bake. Serve warm. I’m bringing this muffin recipe to Fiesta Friday (and sharing here as well). I’m also sharing at Allergy Free Wednesdays. 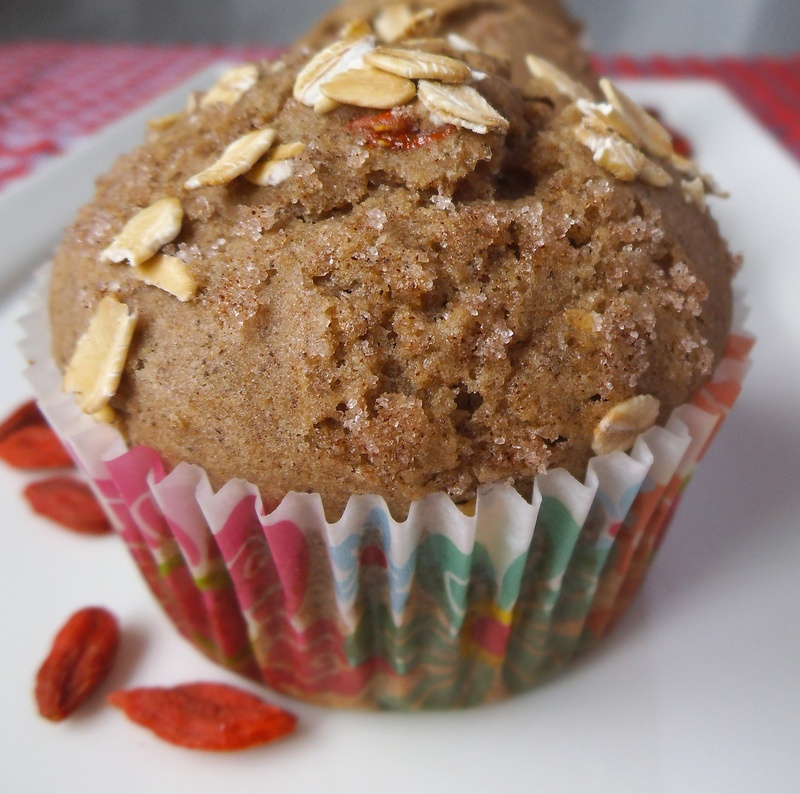 I love healthy muffins – such a lovely thing to have with a cuppa! I must look into your Muffin Tin Month too – it sounds great! Thank you for bringing this to the party – Happy Fiesta Friday!! Thanks, Selma! And a happy Friday to you too! Thanks! I like to stash the extra muffins in the freezer for a quick bite on busy mornings. The vinaigrette is really nice too! I have also tossed some goji berries into apple crisp. That inspired the cider recipe, or vice versa. 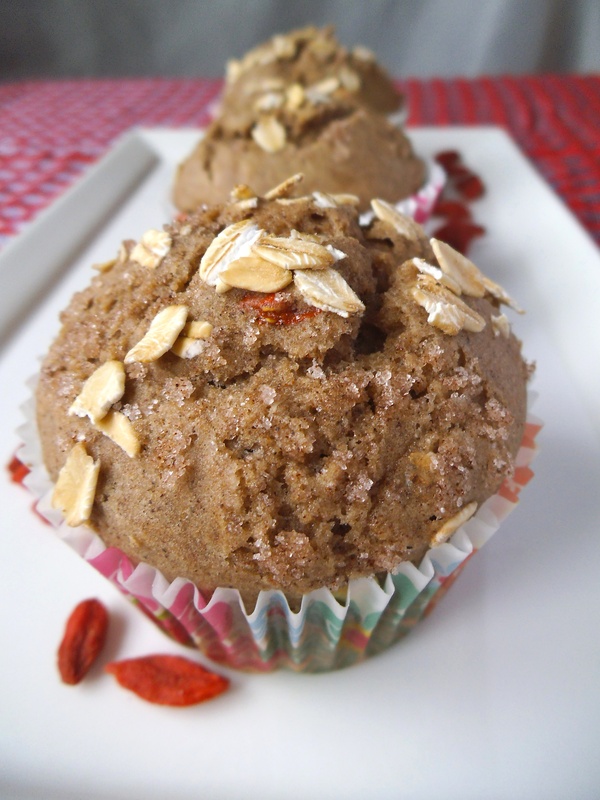 I don’t think I have ever eaten goji berries, but these muffins really make me want to try them and enjoy their health benefits. Plus their warm spices sound amazing! It all works! Hope you try the muffins! Ooh these look super yummy! Goji berries and pears? It’s a combination I would never have thought to try together! These muffins look so delicious! Thanks for sharing! These look amazing! What a perfect combination!